Objective: To use Sensory Organization Test (SOT) by Computerized Dynamic Posturography (CDP) as a monitoring method of analysis in patients with vestibular disorders treated with Vestibular Rehabilitation (VR). Method: A prospective study of 39 patients, aging from 37 to 77 years old, with vestibular disorders submitted to vestibular rehabilitation as treatment modality. Data was acquired by SOT by quantitative analysis before and after Vestibular Rehabilitation. Results: We observed statistically significant increase in values in condition 5, and in the equilibrium score in SOT. These results showed improvement in postural stability. Conclusion: This information shows that SOT by CDP is an adequate method to quantitative analysis to show the vestibular function increase in the Vestibular Rehabilitation. Body balance can be understood as the human ability of being standing straight up and performing movements with no oscillations of falls. This sensory-motor complex is produced by the act of integrating information of the visual, somatosensory and vestibular systems within the central nervous system. Alterations on body balance can cause vertigo, dizziness and unbalance1-4. The evaluation of the body balance consists of tests that either determine diagnostic values or inform the ability of the individual in remaining in a static posture. One of these tests is the Computerized Dynamic Posturography (CDP). It evaluates the body oscillation by recording patient's foot pressure on a platform (forceplate) and it also allows us to analyze the secondary posture reaction towards the central displacement of the body mass5-7. The CDP is a method of quantity and quality evaluation. It is performed with a computed system that analyses the participation of the vestibular, sensory, visual and somatosensory information in the body balance in a global and isolated way and also analyses the central integration of these systems8. Vestibular Rehabilitation (VR) is one of the therapy choices for body balance disorders of vestibular origin. VR aims to accelerate the process of central compensation and to recover the functional balance2,3,9,10. Despite the literature presenting satisfactory results of VR2,5, most studies do not use methods to quantify the symptom evolution. 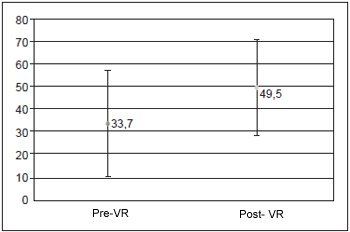 The purpose of this study was to make use of the CPD as a method of quantity monitoring of patients submitted to VR, due to the subjective figures presented up to the present moment. The research was based on a prospective study of 39 patients with vestibular disorders and submitted to VR. This study followed the ethics principles of the Hospital das Clínicas da Faculdade de Medicina da Universidade de São Paulo (HCFMUSP) and it was approved by the Ethics Committee (105/03). Firstly, the participant was introduced to the protocol, when all study purposes and possible questions were explained. All participants signed the Free and Clear Consent Term. All ethics principles (resolution 196/96 - Health Department, 1996) regarding the research ethics in humans and orientations of the Research Ethics Committee were followed. Patients were assisted in the Vestibular Rehabilitation department of the Otorhinolaryngology Clinical Division of the Hospital das Clínicas da Faculdade de Medicina - USP in 2003 and 2004. All individuals were evaluated through the Sensory Organization Test (SOT) in the CPD, with Equitest System® - Version 4.0 introduced by NeuroCom International® - USA. During the SOT, patients remained in standing position on a platform fastened by a safety belt in order to prevent any falls. They were instructed to keep their arms loose beside the body, their feet slightly apart and motionless and gazing forward. All exams were assisted by the same speech doctor and the test commands were standardized for all patients. For each task, three series of repetitions were performed during 20 minutes each. The image of the test above mentioned is displayed in Picture 1. - Condition 6: Standing position, unstable platform and unstable vision with open eyes. - Values obtained in Condition 5 of the SOT: expression of the body stability in Condition 5, instability situation in the platform, with no visual aid, with variation from zero (fall) to 100% (maximum stability). - Balance index (BI): value average obtained in different conditions of the test, with more importance in Conditions from 3 to 6. 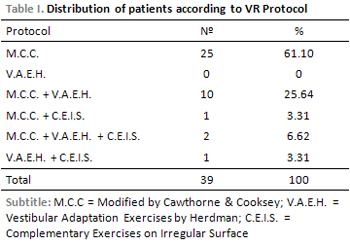 After having performed the first evaluation set through SOT in the CDP, the VR program was initiated through orientations and exercises based on the Modified Protocol by Cawthorne and Cooksey3, on the Vestibular Adaptation Exercises and, when necessary, on the Complementary Exercises performed on irregular surfaces, according to patient's complaints and diagnosis (Table 1). The VR program usually lasts from two to five months (three months on average). The ambulatory follow-up sessions were performed one week after the surgery, two weeks after the surgery and, after the third visit, once a month. Patients were instructed to perform exercises everyday, and at the end of therapy, they were submitted to a new evaluation through SOT in the CDP. The analyzed variables refer to the results obtained from Condition 5 in the Balance Index of the SOT by using t-Student test. The significance index (a) of 5% was used. 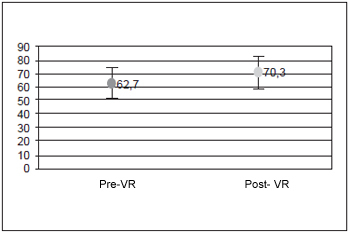 Further, patients' symptom evaluation, after accomplishing the VR program, was performed through a visual-analogue scale in order to verify the patient's clinical response regarding therapy. The scale ranged from 100% to 0%: no symptoms (100%), improvement of symptoms (from 90% to 50%) and no improvement of symptoms (below 50%). The sample was composed of 39 patients aging between 37 and 77 years (average of 58.2 and standard deviation of 12.7); 31 (79.49%) individuals were females and 8 (20.51%) were males. Regarding the localization of the disease, 36 (92.31%) patients presented peripheral origin and three of them (7.69%) presented central origin. Regarding patients' evolution by the visual-analogue scale, 15 (38.46%) presented no symptoms, 21 (53.85%) presented improvement of symptoms and 3 (7.69%) presented no improvement (Table 2). This is similar to SOT result, since the value average in Condition 5 ranged in statistically significant way from 33.7 to 49.5 (p < 0,05) (p = 1.27226) and the Balance Index from 62.7 to 70.3 (p < 0.05), by showing improvement on posture stability (Pictures 2 and 3). Pictures 1 and 2 display the values in Condition 5 and the Balance Index, before and after VR therapy. Concerning the etiology of the disease, the peripheral causes of dizziness prevailed in larger number, which agrees with the literature. As peripheral causes of dizziness occur more often in medical routine, there are more studies on its diagnosis and therapy11. We observed that 92.31% of patients present satisfactory evolution of symptoms through VR therapy by the visual-analogue scale. We could notice the same result regarding the SOT, as the value average in Condition 5 and Balance Index ranged from 33.7 to 49.5 (p < 0.05) (p = 1.27226) and from 62.7 to 70.3 (p < 0.05) respectively, by showing improvement on posture stability. We are aware that the responses to the visual-analogue scale are subjective, which may cause questions concerning patient's symptom evolution. On the other hand, the posturography exam, for being an objective test, provides more reliable results. When we compared the two types of evaluations, we noticed that the responses to therapy were similar in both, which reveals that the posturography result agrees with the visual-analogue scale response2,8-10,12. Besides, the increase on values in Condition 5 of the SOT shows improvement on body stability in situations of instability of the platform with no visual aid. This means an improvement on the vestibular function. It is the best condition to evaluate the vestibular system, as visual and proprioceptive information is reduced7,8. Some studies still report that CDP is a sensitive method that may safely inform the final compensation condition of the balance, thus, even after one of the systems that aid the balance management is injured, patient can make use of other sources of information and keep their proper postures4, 8, 13-16. According to the literature, CDP can be used to the evaluation, rehabilitation and control of the patient with balance alteration7. Our results confirm, in this way, the advantage of the CDP as a method for quantity monitoring of patients with vestibular disorders, before and after VR therapy6, 17. This aspect provides us resources to perform, through quantity arrangements, an objective evaluation of patients' evolution after VR therapy. This information helps us as for provided orientations to patients during treatment an also as for providing reliable information on their evolution18. This study helped us to find out that Computerized Dynamic Posturography is a proper exam to quantify the evolution of vestibular function during Vestibular Rehabilitation therapy. 1. Luxon LM. The medical management of vertigo. J Laryngol Otol. 1997, 111:1114-21. 2. Pedalini MEB, Bittar RSM. Reabilitação Vestibular: Uma proposta de trabalho. Pró-Fono. 1999, 11(1):140-4. 3. Pedalini MEB, Bittar RSM, Formigoni LG, Cruz OLM, Bento RF, Miniti A. Reabilitação vestibular como tratamento da tontura: Experiência com 116 casos. Arquivos Internacionais de Otorrinololaringologia. 1997, 3(2):87-90. 4. Barbosa MSM, Ganança FF, Caovilla HH, Ganança MM. Reabilitação labiríntica: o que é e como se faz. RBM-ORL. 1995, 2(1):24-34. 5. Asai M, Watanabe Y, Shimizu K. Effects of Vestibular Rehabilitation on Postural Control. Acta Otolaryngol. 1997, 528:116-20. 6. Black FO, Angel CR, Pesznecker SC, Gianna C. Outcome Analysis of Individualized Vestibular Rehabilitation Protocols. The American Journal of Otology, 2000, 21(4):543-51. 7. Black FO, Pesznecker SC. Vestibular adaptation and rehabilitation. Otology and neuro-otology. 2003, 11(5):355-60. 8. Black FO. What can posturography tell us about vestibular function? Annals of the New York Academy of Sciences. 2001, 942:446-64. 9. Norré ME, De Weerdt W. Vestibular habituation training: technique and first results. Acta Oto-Rhynol-Laryngol. Belg. 1979, 33(3):347-69. 10. Shepard NT, Smith-Wheelock M, Telian SA, Raj A. Vestibular and balance rehabilitation Therapy. Ann. Otol. Rhinol. Laryngol. 1993, 102:198-205. 11. Whitney SL, Wrisley DM, Brown KE, Furman JM. Physical therapy for migraine-related vestibulopathy and vestibular dysfunction with history of migraine. Laryngoscope. 2000, 110:1580-30. 12. Furman JM, Whitney SL. Central causes of dizziness. Phys Ther. 2000, 80:179-87. 13. Keim RJ, Cook M, Martini D. Balance Rehabilitation Therapy. Laryngoscope. 1992, 102:1302-7. 14. Cohen HS, Kimball KT, Stewart MG. Benign paroxysmal positional vertigo and comorbid conditions. ORL J Otorhinolaryngol Relat Spec. 2004, 66(1):11-5. 15. Konrad HR, Tomlinson D, Stockwell CW, Norré M, Horak FB, Shepard NT, Herdman SJ. Rehabilitation Therapy for patients with disequilibrium and balance disorders. Otolaryngol Head and Neck Surg. 1992, 107(1):105-8. 16. Mruzek M, Barin K, Nichols DS, Burnett CN, Welling B. Effects of Vestibular Rehabilitation and Social Reinforcement on Recovery Following Ablative Vestibular Surgery. Laryngoscope. 1995, 105:686-90. 17. Medeiros IRT, Bittar RSM, Pedalini MEB, Formigoni LG, Bento RF. Vestibular rehabilitation in children. Otol Neurotol. 2005, 26(4):699-703. 18. Cass SP, Borello-France D, Furman JM. 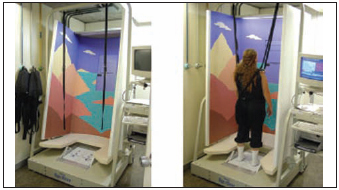 Functional outcome of vestibular rehabilitation in patients with abnormal sensory-organization testing. Am J Otol. 1996, 17(4):581-94. 1. Audiology Specialist by Irmandade da Santa Casa de Misericórdia de São Paulo (Speech doctor of the Audiology and Vestibular Rehabilitation department of the Otorhrinolaryingology Clinical Division of the Hospital das Clínicas da Faculdade de Medicina da Universidade de São Paulo). 2. PhD in Medical Science by Experimental Physiopathology of the Faculdade de Medicina da Universidade de São Paulo (Volunteer Researcher Speech Doctor of the Vestibular Rehabilitation department of the Hospital das Clínicas da Faculdade de Medicina da Universidade de São Paulo). 3. PhD on Medicine by the Otorhinolaryngology Disclinine of the Faculdade de Medicina da Universidade de São Paulo (ENT doctor of the Otorhrinolaryingology Clinical Division of the Hospital das Clínicas da Faculdade de Medicina da Universidade de São Paulo). 4. PhD on Medicine by the Otorhinolaryngology Disclinine of the Faculdade de Medicina da Universidade de São Paulo (ENT doctor responsible for the Otoneurology department of the Otorhrinolaryingology Clinical Division of the Hospital das Clínicas da Faculdade de Medicina da Universidade de São Paulo). This article was submitted to SGP (Sistema de Gestão de Publicações) of R@IO on June 30th, 2008 and approved on July 7th, 2008 at 15:27:58.